Order a print-on-demand copy of Thrust Magazine on high-quality gloss paper and have it delivered to your door. 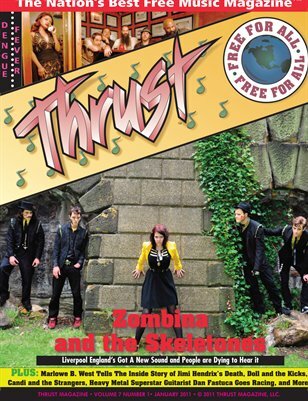 This month's issue features Best of the British, including Zombina and the Skeletones, which is Liverpool's hottest band, and Doll and the Kicks from Brighton. Hop back across the pond for Marlowe B. West telling you the inside story of Jimi Hendrix's death, the best Cambodian pop/garage band in Los Angeles, Candi and the Strangers, which want to be the first band to play the International Space Station, and a look back at rock-n-roll as it happened in 1983 with Def Leppard. There's more, too—lots more. Metal pioneer band Nasty Savage and the metal-award-winning Fester reunite for a special one-show-only benefit, heavy-metal superstar-guitarist Dan Fastuca goes racing, world-famous singing coach Al Koehn shows you how to pick the right singing instructor, Dan Fastuca reviews the Digitech GSP-1101 rack-mount effects processor, Pendulum prepares to release its #1 U.K. album in the USA, and more!